Diagnosing Fibroids | Fibroid Symptoms | Do You Have Fibroids? Fibroid tumors affect as many as 50% of women. Some fibroid patients show no symptoms at all. These benign tumors frequently develop within the female reproductive system. While their cause is generally unknown, they often create painful and abnormally long menstrual cycles. 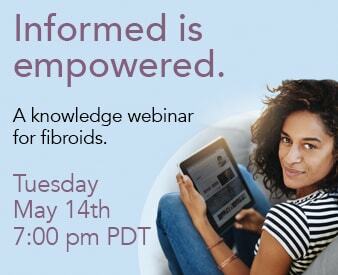 How do you know if you have fibroids? Only a doctor can answer. Fibroids are the most common tumors seen in the female reproductive system and the leading cause of hysterectomies in the United States. It is estimated that 30% of women under 35 will have fibroids, with that number jumping to 50% by the age of 50. Only about one third of these are large enough to be detected by a doctor during a physical examination. It is important to note that fibroids have no relation to a woman’s risk of uterine cancer. While most cases of fibroids are relatively harmless, some will require treatment. Fibroid surgery may be suggested. However, non-invasive options do exist. Embolization has long been a safe and non-surgical procedure to reduce bleeding during uterine surgery. Today, Uterine Fibroid Embolization is used as an effective way to shrink fibroids without harming chances for pregnancy. In cases where there is heavy or prolonged bleeding during and between menstrual cycles, a woman can experience iron-deficiency anemia which will require additional treatment. Degree and intensity of fibroid symptoms will vary. Some women may experience very mild fibroid symptoms or none at all. Diagnosing Fibroids – How Are Fibroids Diagnosed? • Hysterosalpingography – this test uses a dye to highlight the uterine cavity and fallopian tubes on x-ray images. • Hysteroscopy – this is a procedure in which a physician inserts a small telescope called a hysteroscope through the cervix and into the uterus. Then, saline is injected, expanding the uterine cavity. This allows the physician to examine the uterine and fallopian tube openings. • Endometrial biopsy – In this procedure a tissue sample is taken from the uterus and tested to see if there are any harmful cells present. Fibroids grow rapidly before the menopause, and often continue to enlarge in the menopause. If you begin to experience unusual discomfort, this could indicate that the fibroids are growing. Be sure to see your doctor regularly, and if you have any pressing concerns, consult them immediately. If you have questions or concerns about fibroids, contact the Fibroid Treatment Collective. Disclaimer: The ideas, procedures, and suggestions contained on this website are not intended as a substitute for consulting with your physician. All matters regarding your health require medical supervision. Uterine Fibroid Embolization has been known to provide relief from their symptoms and significant fibroid shrinkage. Results may vary for individuals.